I don’t usually post on the weekends. I had planned on posting last night but someone got sidetracked shopping at The Home Goods store for Christmas decorations. 😉 Boy, the store was a mob scene, but I’m glad that I went because I wanted to see what they had before it got picked over. It’s the kind of store that’s a hit or a miss but I’m happy to say that the crowds and long line was worth it because I did get a few things. I’ll be sharing some sneak peaks on instagram and twitter before the big reveal on the blog, but to give you an idea, I’ll be doing a red theme this year. I didn’t want to let one more day go by without sharing this recipe with you because it’s one of my favorites ever. Chocolate. Crumb. 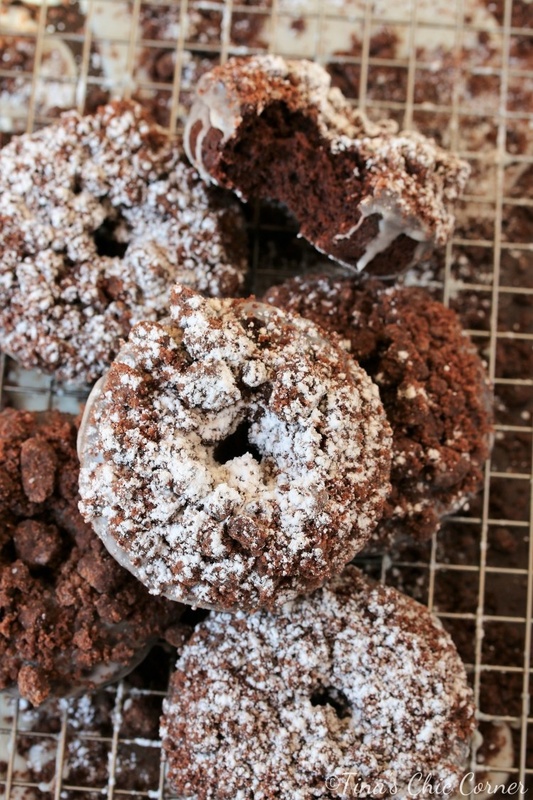 Doughnuts. Oh yes. 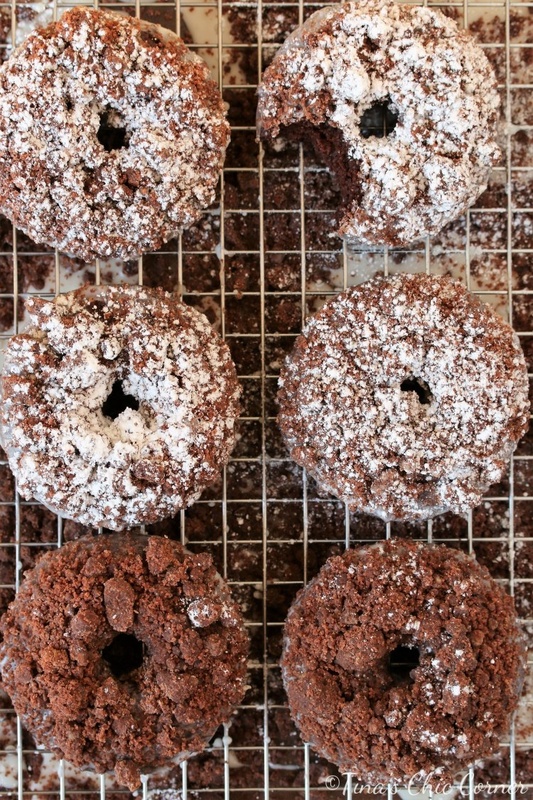 A few months ago I made vanilla crumb doughnuts. They were such a hit and my family went bonkers over them. When I saw that Allie, from Baking a Moment, also made a chocolate version I knew that I had to make them too. By the way, if you’ve never checked out Allie’s blog before then you really must. I kind of have a blog crush on her. Her recipes look delicious, her photography is gorgeous, and she’s so nice. 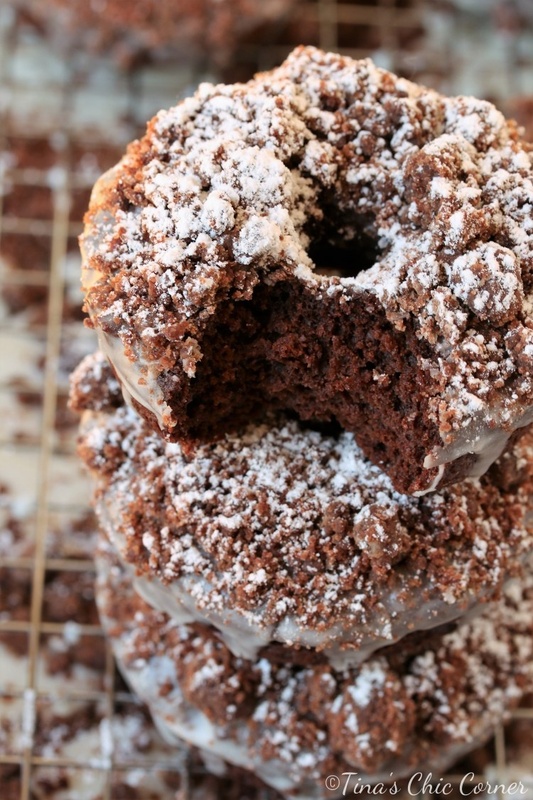 If you simply make this chocolate doughnut then you’ve still got a winner of a breakfast. 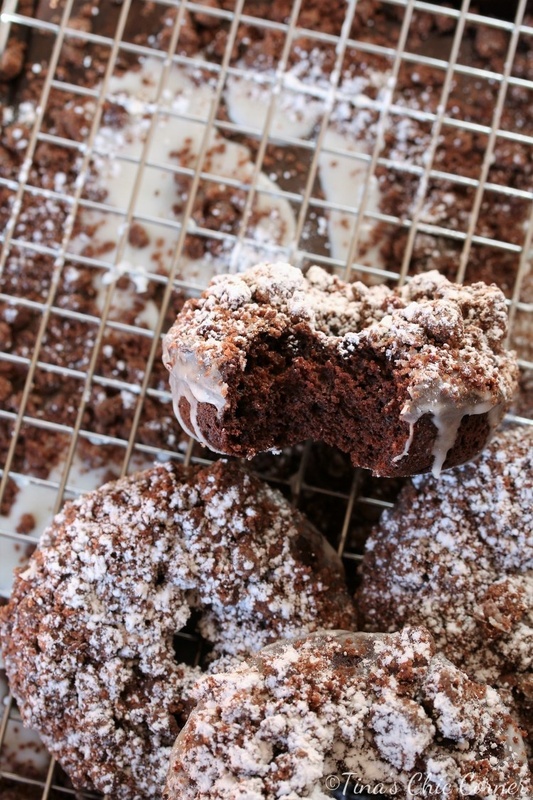 It’s chocolaty and moist and really delicious. But why stop there? You must try the glaze, too. I don’t usually have good luck with glazing doughnuts because it ends up being too liquidy and tends to make the doughnut mushy. That is not the case here. 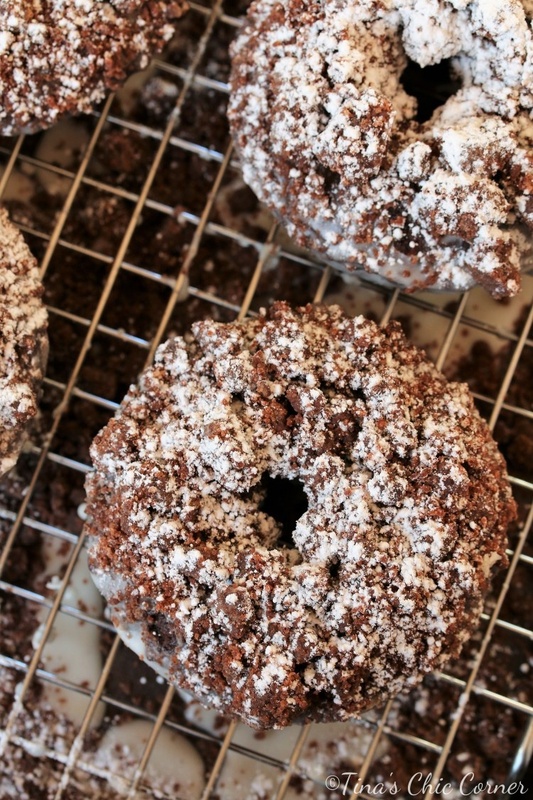 The glaze is sweet perfection and nicely coats the doughnut. I only glazed the tops of the doughnuts because I didn’t want to overdo it, but feel free to coat the whole thing, I won’t judge you. 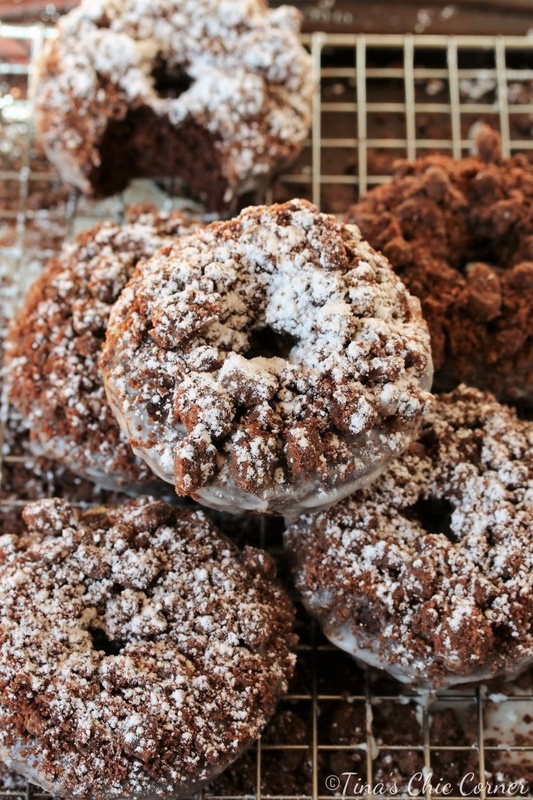 Let’s not forget the precious, aka powdered sugar. I tried not to cover them too much so that you could see the crumb topping but I couldn’t help myself. More is better, right? Yes, always, when it comes to powdered sugar. Can you see why I couldn’t wait to share this. Plus I figure what better way to start a Saturday morning. Time to make the doughnuts! Add in the sugar, cocoa powder, flour, and salt and stir everything together. Cook for about 5 minutes, stirring occasionally, or until it’s crumbly. In a medium bowl, whisk together the powdered sugar, milk, and vanilla extract. Set it aside to use for when the doughnuts have cooled completely. In a large bowl, add the flour, baking soda, and salt. Then sift in the cocoa powder. (Okay, sifting it isn’t strictly required, but it really does help to make it nice and even.) These are the dry ingredients. In a small bowl, whisk together the sour cream, sugar, oil, egg, and vanilla extract. These are the wet ingredients. Pour the batter evenly into the 6 greased doughnut cavities. Get a wire rack and lay parchment paper or a cookie sheet underneath it. This is the prepping station for glazing and crumbing steps. Dunk the doughnuts into the glaze, covering the top of the doughnut. 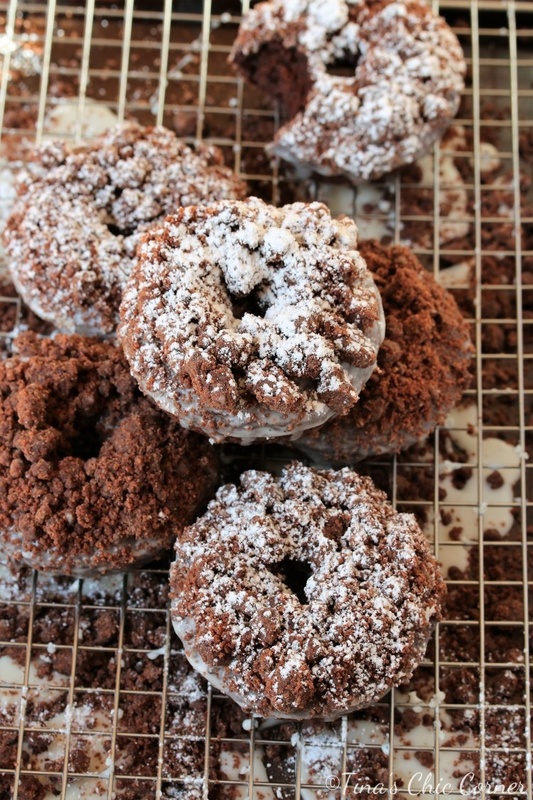 Immediately sprinkle the crumb topping on top of the doughnut and gently press them down to help secure them. Let the doughnut stand until the glaze has set. Repeat steps 10 through 12 for each doughnut. Try not to eat all 6 in one sitting. Amazing!!!! They look better than a store brand that’s on the market (Entemann’s). Your pictures of them are so inviting that I wanted to grab one to eat. I guess I’ll just have to make them. Yum!